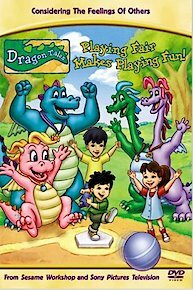 Dragon Tales is a series designed for toddlers about a world where Dragons exist but can only be accessed through a magical chant by the main characters Max and Emmy. Max and Emmy are brother and sister with Emmy being the older of the two, when they play together in their room and recite a special poem over a dragon scale that they found together, they are suddenly transported away to a magical land filled with all sorts of Dragons. Hence the reason the show is titled Dragon Tales. Once they arrive in Dragon Land, they have several Dragon friends with which they can go on adventures and experience the magical world. Emmy and a shy dragon named Cassie are best friends, while Max and a large boisterous dragon named Ord are inseparable. There is a two headed dragon, viewed much like twin brother and sister named Zak and Wheezie and the fearless, wise lead dragon that usually provides the educational portion of the show is named Quetzal. There is even a dragon in a wheelchair named Lorca and consequently this dragon is unable to fly. There are several other dragons however the show mainly focuses on this key group while trying to educate preschoolers on sharing, playing fair, good manners, tolerance and several other key developmental areas for toddlers. Each episode is usually between 20-22 minutes and has two to three songs to entertain and teach. The show ran for 6 full years starting in 1999 and ending in 2005 and has more than a hundred episodes making it a fairly successful children's series. While putting their heads together for a very important project, dragon siblings Zak and Wheezie discover that two heads are better than one. / Max tackles his fear of riding horses when roving ponies trot into town. Max and Emmy are excited to get to Dragon Land, as today is the big opening of the Dragon Land Aquarium. / It's time for Quetzal to read from the Magic Story Book, but Enrique has never chosen a story. Enrique arrives one warm spring day to find Max and Emmy in their winter clothes! Max and Emmy are going to Dragon Land to sled on Snowy Summit. / Max is afraid of making a mistake in the lead role of the School in the Sky play. Emmy and Max go to Dragon Land, eager because Cassie said she was bringing a surprise to the School in the Sky. / Max, Emmy and Enrique don't have school today, but they are joining the dragons at the School in the Sky. Max, Emmy and the dragons find a baby flower in need of help. They learn just the right things to care for her before searching for her family. / Max and Emmy's arguing upsets Enrique, so he goes to the magical wishing well in Dragon Land. Max taught Zak and Wheezie a song to perform for Princess Kidoodle, but when performance day arrives, Zak and Wheezie refuse to come out of their cave. / Emmy is going to sleep-away camp for a week. Max wants to see the once-a-year event of all time in Dragon Land -- the Bursting Blossoms blooming! / Emmy is invited to become part a dragon Girl Scout group called Dragon Scouts but worries that she doesn't fit in. Ord and the other dragons are trying out for sky soccer --- a game in which the ball must stay in the air and you can only use tail, chest, knees and feet. / Cassie's upset because she has to move to a new room to make space for two new babies. The time has come for a big race in which people are paired together to race however they can (other than flying) down a set course. / Emmy finds a baby bird and grows attached it, but has a hard time letting go when it's separated from its family. Celeste, a star, comes down to Dragon Land during the day. She enjoys being a star, but misses out on all the daytime activities. / Everyone is excited about the new attractions at the Dragon Land amusement park -- except for Zak. Our friends have a fun game of card-house building in mind, but a giant earthquake puts an end to that plan. / Cassie finds herself having a lack of confidence when she can't seem to win a prize at the Dragon Land fair. The Junior Unicorn Race is in peril. Eunice the Unicorn asked for Mungus the Giant's help in putting up signposts, but he put them up way too high. / Emmy is making things out of clay and having a good time, but Max is moping at the playroom window. Max wants to play with Emmy and Enrique, but they're working on a whale project for school. He hopes that a trip to the Dragon Land Carnival will change things. / Zak and Wheezie have a smelly problem: They've been sprayed by a Stinkydink bug. Max, Emmy and Enrique are called to Dragon Land for a going-away party for Cassie's big sister, Sophie. / The gang is enlisted by Quetzal to help bring some soup to his sick brother, Fernando. Unfortunately, they encounter a grumpy old troll. Emmy and Max are going to watch Princess Kidoodle be crowned queen of the doodle fairies. / Max, Emmy and Enrique head to Dragon Land for a game of hopscotch, where they find Ord in a very out-of-sorts mood. Emmy, Max and the dragons are playing dragon basketball. The other team has a lot of bullies, and they try to make star player Emmy lose her confidence by teasing her. / Emmy, Max, and Enrique are going on a sky-sailing adventure. After receiving a present from Max and Emmy, Enrique is treated to a surprise birthday party. / Everyone's invited to Willie the Snow Seal's birthday. One of the required activities is ice skating, which Zak and Wheezie have never done before. Emmy has a brand new skateboard and she's ready to get skating! / On a trip to Dragon Land, Max is paired with Lorca for a scavenger hunt that involves collecting rare plants for the School in the Sky garden. Max, Emmy and Enrique arrive in Dragon Land and join the dragons in heading to the Doodle Fairy Kingdom Flower Festival. / Zak needs a Jugglebug for his talent show act, but Wheezie's trumpet practice keeps scaring it away. Max, Emmy and Enrique all decide to visit Dragon Land after the threat of an oncoming storm forces them to abandon their plans for chalk drawing outside. / A mysterious weather problem is placing Chilly the snowman and his dog, Nippy, in danger. When Cassie's mom accidentally throws Finn's blankie in the laundry, Finn is devastated. / Max and Emmy's mom is baking cookies. Max and Emmy love cookies, but they know they have to wait until they're finished baking before they can eat them. The gang meets a new dragon, Lorca, who uses a wheelchair to get around. He shows them a treasure map, and they go off to look for the treasure. / Enrique arrives just in time to help out with El Dia del Maestro, a celebration held every year. When Max gets to Dragon Land, he finds Ord's lucky stone. / Max has been anticipating riding the Dragonland Express for days, but the journey grinds to a screeching halt when it turns out that some of the train tracks are missing. While rummaging through a Cave Swap, Wheezie is astounded by a two-headed golden statue. Zak chimes in, starting an argument with her about her junk collection. / Cassie, Emmy and the dragons team up to find eggs in a Dragon Land custard egg hunt. Our friends have a fun game of card-house building in mind, but a giant earthquake puts an end to that plan. / The time has come for the Dragon Land Road Race. Enrique has joined Lorca on his modified wheelchair. Ord and the other dragons are trying out for the sky soccer team. Ord doesn't do very well and tries to quit. / The Junior Unicorn Race is in peril. Eunice the unicorn asked for Mungus's help in putting up signposts, but he put them up way too high. Max teaches Zak and Wheezie a song to perform for Princess Kidoodle. But when performance day arrives, they refuse to come out of their cave. / Max and Emmy's arguing upsets Enrique, so he goes to the magical wishing well in Dragon Land. Max wants to see the Bursting Blossoms blooming! But it happens at sunrise, and Max has trouble waking up. / Enrique arrives one warm spring day to find Max and Emmy in their winter clothes! They're going to Dragon Land to sled on Snowy Summit. Max and Emmy have a new neighbor, Enrique. He's just moved from Colombia and hasn't had much luck making new friends. After thinking it over for a bit, Max and Emmy decide to introduce Enrique to Dragon Land. Max and Emmy try to help the dragons find their way out of a forest called Puzzlewood. / Wheezie opens a music box that causes her and Zak to start dancing. As long as the music keeps going, they can't stop dancing. Zak carries a grudge against Wheezie after she carelessly breaks his treasured snoot flute. / Emmy and Max are called to Dragon Land to visit the brand-new attraction at the amusement park: a funhouse. Cassie has bad news. Her family is about to hatch a couple more eggs and she has to move out of her current room and into a different one. / Emmy is making things out of clay and having a good time, but Max is moping at the playroom window. Max is elated when he lands the lead in the school play, until he begins to worry about making an embarrassing mistake in front of the audience. / Emmy takes her new skateboard to Dragon Land, where Ord wants to try it -- and promptly loses it. Cassie, Emmy and the dragons team up to find eggs in a special Dragon Land custard egg hunt. / The dragons, Max and Emmy are all invited to Spike's fiesta. However, Zak injures his wrist and wants to go home. Max, Emmy and the dragons are out flying kites, but the wind in Dragon Land seems to have died down completely. / Everyone is excited about the new attractions at the Dragon Land amusement park, except for Zak. He's scared of the fast new rides. Zak and Wheezie are practicing for a talent show. Zak needs a Jugglebug for his act, but Wheezie's practice with her trumpet keeps scaring it away. / On Dragontines Day, everyone celebrates with a special dance, but Ord can't seem to do the moves. Everyone's invited to Willie the Snow Seal's birthday. It's like a typical birthday party, but one of the required activities is ice skating, which Zak and Wheezie have never done before. / Zak has a new dragondisk that needs cleaning. Emmy, Max and the dragons are playing dragon basketball. The other team has a lot of bullies, and they try to make star player Emmy lose her confidence by teasing her. / Zak and Wheezie have a smelly problem: They've been sprayed by a Stinkydink bug. Max accidentally lets a baby pig get out. He joins the search for the pig and finds out that it's a lot like him. / Max, Emmy and the dragons find a baby flower in need of help. They learn how to care for her before searching for her family. Max and Emmy have a new detective kit, and they're eager to show it to the dragons. Once in Dragon Land, they find a real mystery -- Cyrus the serpent is swiping dragongull eggs. / Quetzal enlists the gang to help bring some soup to his sick brother. Cassie's little sister and brother are getting tired of the same old stories. The gang decides to take them into Quetzal's Pop-Up Book, where they create stories using their imaginations. / Emmy is invited to become part a dragon Girl Scout group. Cassie wants to try out for a school play. She's never been in one before, and her shy nature threatens to keep her from even trying. / Emmy finds a baby bird and grows attached it, but has a hard time letting go when it's separated from its family. Emmy and Cassie find themselves lost in a series of tunnels after some pickup sticks from their game are inadvertently taken by the Giant of Nod. / Max, Emmy and the dragons accidentally ruin a giant dessert that Mungus made for his mom. Emmy and Max are going to watch Princess Kidoodle be crowned queen of the doodle fairies. / Emmy is eager to go to Dragon Land to pick crystals with Cassie. Emmy and Max are eager to go to Dragon Land because Cassie said that she was bringing a surprise to the School in the Sky. / Max, Emmy and Enrique don't have school today, but they are joining the dragons at the School in the Sky. The gang meets a new dragon who uses a wheelchair to get around. He shows them a treasure map, and they go off to look for the treasure. / Emmy brings a pomegranate to show and tell, but the class is more interested in Cassie's pet butterfrog. After a bad experience in a baseball game, Max wishes that he could be bigger. It works, and soon he's bigger than Mungus the Giant. / Max and Ord work on a project together, but they find themselves at odds over who should take possession of it. Max and Emmy are excited to get to Dragon Land, as today is the big opening of the Dragon Land Aquarium. / Max and Emmy are playing dress-up. Max dresses up as a king and asks Emmy if she wants to be queen, but she'd rather be a doctor. Ord faces his fear of the darkness once again when he's stuck in a dark cave. He and his friends all work together to get him unstuck. / Cassie finds herself lacking confidence when she can't seem to win a prize at the Dragon Land fair. When Max gets to Dragon Land, he finds Ord's lucky stone. But he doesn't realize what it is, and it ends up getting lost. / The dragons have built a new obstacle course, and everyone wants to try it out right away.